There is a mystique that romanticizes the gold-digger. Holly Golightly is an icon of that ambitious young woman. She is a naif, an innocent, a survivor. Emilia Clarke as Holly Golightly with Vito Vincent in a photo by Nathan Johnson. Fred, a writer whose success is not guaranteed, and whose charm is plentiful, comes on the scene in a torrential rain, reciting lines so poetic he sounds like Tennessee Williams reincarnate. 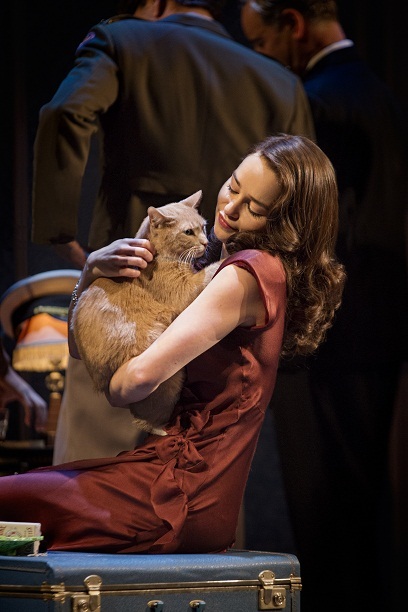 In fact,there are many positively lyrical passages in Richard Greenberg’s adaptation of Truman Capote’s “Breakfast At Tiffany’s,” currently enjoying an open run at the Cort Theatre, with the young British star from “Game Of Thornes,” Emilia Clarke, as Holly Golightly. Holly is an object of desire for men of all persuasions, even Joe Bell (George Wendt) the bartender with whom Fred (Cory Michael Smith) and I.Y. Yunioshi (James Yaegashi), both now prosperous, reminisce about the long lost Holly. As a conceit, having breakfast at Tiffany’s doesn’t conjure the intended image of luxury. 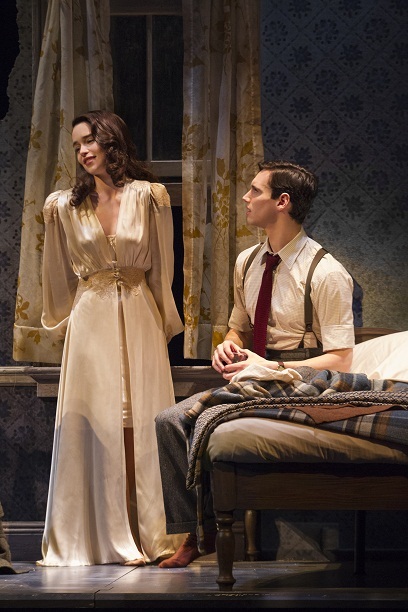 As a play, “Breakfast at Tiffany’s” is a little like a tonic one takes in aid of sleep. Perhaps to enjoy that early meal amid gold and diamonds. 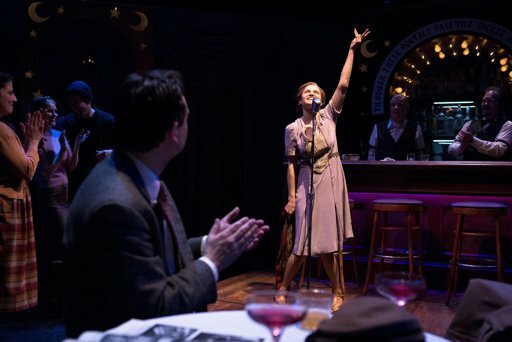 The staging, with scenic design by Derek McLane and projections designed by Wendall K. Harrington, and lighting by Peter Kaczorowski, is remarkably alive and vivid. The storyline and production is a bit dull, even though all the acting is excellent. Cory Michael Smith’s lovestruck Fred is particularly outstanding. Emilia Clarke is aflutter with the conflicting emotions and intelligence of her character. Emilia Clarke as Holly with Cory Michael Smith as Fred. Photo by Nathan Johnson. In the interest of complete honesty, not entirely in keepig with Holly’s vaunted style, this reviewer is neither a fan of Truman Capote nor smitten by the film his novella inspired. Don’t expect to be humming “Moon River” on your way out of the theater. It is always an honor and a privilege to witness a Taylor dance performance. The Paul Taylor Dance Company is holding its second spring at the David H. Koch Theatre on the Lincoln Center campus through March 24th. So many of the pieces Paul Taylor has created elevate our understanding of even simple things to delightful new heights. Among those exciting and sometimes revelatory experiences, there are the flowing movements of “Cascade,” a dance he choreographed in 1999 or “Eventide.” The latter is a companion piece to Taylor’s beautiful new work, “Perpetual Dawn.” (See the review of the world premiere here.) Or is it the other way around, since the intimate “Eventide” was created in 1997? The moody backdrop of a lone tree -with set and costume design by Santo Loquasto– and Jennifer Tipton’s lighting are characters in “Eventide.” The dance is set in seven parts to music by Ralph Vaughan Williams. The exceptionally lovely interlude in “Eventide,” Musette was danced by Parisa Khobdeh and Michael Trusnovec at our performance with a wonderful lyricism. Heather McGinley and Francisco Graciano also made a particularly nice pairing in Moto Perpetuo. Story-telling is one of the delights of a Taylor work, and in “To Make Crops Grow,” he takes his time to the reveal, riffing along the way on human nature and foibles. “To Make Crops Grow,” enjoying its premiere season this year, making it dance number 137 in the Taylor compendium, with music by Ferde Grofe, is tantalizing in its pace. “Le Sacre Du Printemps (The Rehearsal)” is celebrating the anniversary of the Nijinsky-Stravinsky collaboration that ended in near riot in Paris in 1913. Taylor’s take blends humor with brutality, making fun of Nijinsky’s maligned ballet, but not completely abandoning its theme of sacrifice. Amy Young’s on-going tantrum of loss is poignantly amusing. The mix of joyful and barbaric, is also seen in “Company B,” a personal favorite, where the hope and bounce of the dancing and the songs by the Andrews Sisters contrast with the ugly realities of war. Randy Sharp’s “Last Man Club” is being remounted by Axis Theatre Company through 30 Mar, having been cancelled in the aftermath of Sandy. It is a fitting irony that a storm blew away the original launch date for this performance. Wild weather is the backstory for “Last Man Club,” too. “Last Man Club” is set in the Dust Bowl of 1936. As ten years of drought have decimated farms in a 200-mile wide surge of storms, one family has decided to risk staying. Working together is the very definition of collaboration, of course, so the 2nd Annual Collaborative Concert features a large group of musicians working with the youngsters from the Noel Pointer Foundation’s Youth Orchestra. Members of the NPF Youth Orchestra are getting a big break this week when The Noel Pointer Foundation and the Brooklyn Conservatory of Music co-host this concert. 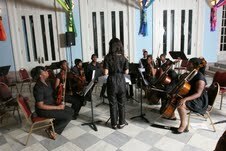 Twenty-three of them will perform with musicians from Julliard, N.Y.U. and Manhattan School of Music at this grand event at St Ann & The Holy Trinity, 157 Montague Street, Brooklyn on March 22nd at 7pm. The program ends on a high note, with Gershwin’s beautiful and emblematic “Rhapsody in Blue,” featuring World Piano Competition Winner, Tatiana Tessman. To learn more, visit NPF on the web. Heeding the admonition to “write what you know,” A.R. Gurney chronicles the WASP experience with its expectations and disappointments. The expert interpreters at the Keen Company are reviving a slightly updated version of Gurney’s 1991 “The Old Boy,” through March 30th at the Clurman on Theatre Row. 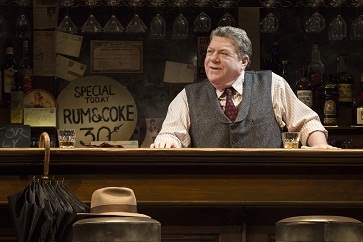 Jonathan Silverstein directs the production which features Peter Rini, Cary Donaldson, Tom Riis Farrell, Laura Esterman, Chris Dwan and Marsha Dietlein Bennett. 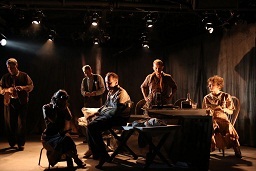 For more information and tickets for “The Old Boy,” visit Keen Company on-line. There is an adage that luck is what you make it. Having advantages is not the same as being advantaged. In “The Luck of the Irish,” Kristen Greenidge’s excellent new play at LCT3’s new Claire Tow Theater that just closed March 10th, the well-educated middle class Taylors would seem to be ideal neighbors in a decent suburb of Boston, except for the redlining that keeps black families from buying in to the American dream. The Donovans, poor and uneducated have to ghost buy the property for them. Patty Ann Donovan’s (Amanda Quaid as the younger and Jenny O’Hara in 2012) mantra “There is an order to things…” is the whine of the overlooked. Dr. Taylor (Victor Williams) and his wife Lucy (the phenomenal Eisa Davis) are sophisticated people. Mrs. Taylor and Patty Ann’s husband, Joe (Dashiell Eaves) are kindred spirits,dreamers lost in a love of words. The winds of change that Joe foresees in the late 1950s do not serve the Taylor’s granddaughters, Nessa Charles (Carra Patterson) and Hannah Davis (Marsha Stephanie Blake) and her husband Rich (Frank Harts), as they try to negotiate among their neighbors in 2012. Change takes on a very different form in Annie Baker’s “The Flick,” at Playwrights Horizons through March 31st, when a movie theater in the Worcester environs changes hands. The new owner will take it from celluloid to digital– the wave of the future, but one that has Avery (Aaron Clifton Moten) distressed. The feel and look of film, as he points out, is meant to be on celluloid. His fellow employees are movie buffs also, but they are just working minimum wage jobs. Neither Sam (Matthew Maher) nor Rose (Louisa Krause) share his passion or intensity. David Zinn’s set for “The Flick” is very impressive. There is nothing wrong wth “The Flick” that some prudent editing couldn’t fix. Many of the pregnant pauses, slow takes and musical transitions, really belong on the cutting room floor.Sam Gold might have done more with his discretion in pacing the play better, Annie Baker could have been more concise. 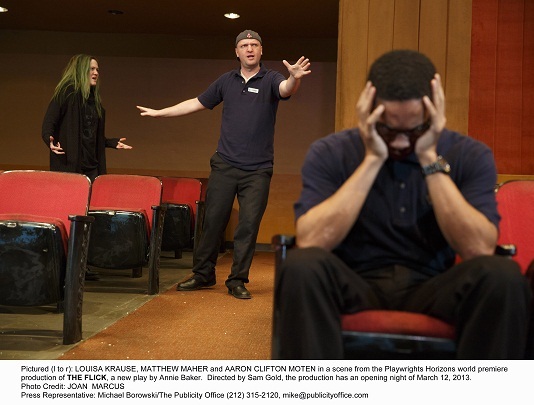 Avery (Aaron Clifton Moten) is ever introspective in “The Flick” at Playwrights Horizons. Photo by Joan Marcus. 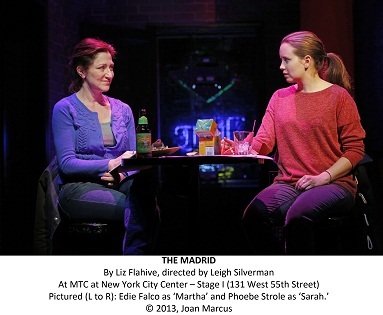 In “The Madrid,” Liz Flahive’s concise and tightly written new play at Manhattan Theatre Club’s NY City Center Stage I through May 5th, on the other hand, the pacing and structure are really quite perfect. Change is something for which the main character in “The Madrid” yearns, and her family dread. “The Madrid” offers an odd point of view, but one that calls for thinking and questioning. Martha (Edie Falco) is a kindergarten teacher who chooses to disappear. She moves to a somewhat derelict apartment near the lovely home she shared with her husband, John (John Ellison Conlee) and their daughter Sarah (Phoebe Strole). Her disappearance is no surprise to her mother, Rose (Frances Sternhagen) who undertakes some desperate measures to bring her back, nor to John. Sarah on the other hand is completely unmoored. She raises to the occasion, moving back to live with her dad, driving her grandmother around, and dealing with the ostreperous neighbors, Danny (Darrne Goldstein) and Becca (Heidi Schreck), who feels the loss of her friend keenly. Martha, it seems, simply wants a timeout, from the responsibilities of her life. She likes the noise and quiet of her new life, but she misses Sarah. 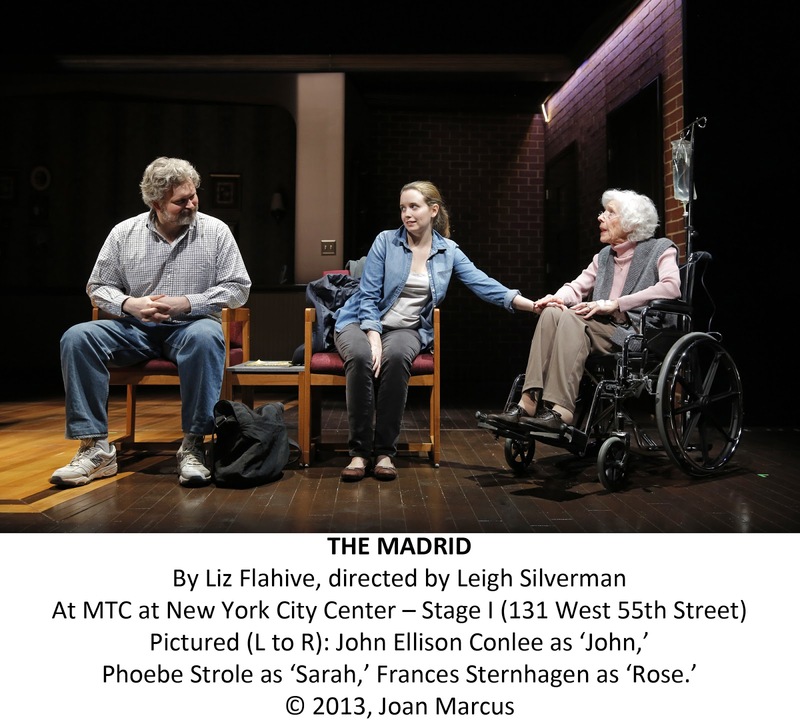 John Ellison Conlee as the steady John, Phoebe Strole as Sarah, Frances Sternhagen as Rose. Photo by Joan Marcus. Let’s face it, none of us likes to be left hanging. It’s natural to want to know how a story, once begun, ends. For the occasion of this production, the entire theater is turned into London’s Music Hall Royale at the turn of the century, presided over the master of ceremonies, The Chairman/Mr. William Cartwright (Jim Norton). Holmes’ musical of “The Mystery of Edwin Drood” is set as a solid Victorian melodrama enveloped in a lively vaudeville. Since this is a play within a review, each cast member has two parts, as actor and character of rhe play within. The audience participates, all the way to “voting” on whodunnit and is incited to applause and mayhem from the beginning to the end. It is the Princess Puffer. the Music Hall’s doyenne, Miss Angela Prysock (Chita Rivera) who supplies John with the opiates that fuel is evil spirits. The “The Mystery of Edwin Drood” is grand fun. William Ivey Long’s opulent costumes add to the playful tone set by Scott Ellis’s direction and the superb cast. Paul Taylor Dance Company’s Grand Gala! The gift that Paul Taylor shares with us is not his longevity –he’s 82, as it happens– but his lifelong creativity! His latest creation, “Perpetual Dawn,” which enjoyed a world premiere at the Gala on March 5th at Lincoln Center’s David H. Koch Theater, is a balletic work set in a rustic backdrop. A troupe of eleven dancers, clad as turn of the century peasants under a gorgeous landscape backdrop.The set and costumes are by Santo Loquasto with lighting by James F. Ingalls adding to the blissfully pastoral atmosphere of the piece. “Perpetual Dawn” is excitingly balletic! “Offenbach Overtures,” Paul Taylor’s 1995 tweak on the composer of the can-can makes for a light-hearted and beautiful romp. Even for big fans of Moulin Rouge, Toulouse-Lautrec and La Belle Epoque, “Offenbach Overtures,” is supremely funny. The Paul Taylor Dance Company’s spring season offers more hi-jinks and high kicks, continuing on through March 24th. For information and tickets, please visit www.ptdc.org Tickets may also be purchased at the David H. Koch box office on the Lincoln Center plaza.